I found this website last week. 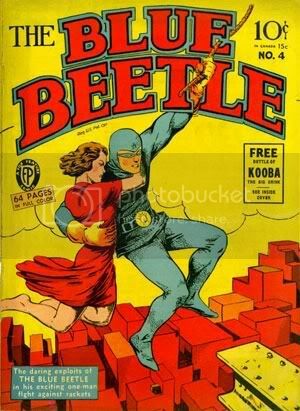 It has tons of old comic books, available for download. Then I downloaded a comic book reader. This works really well. The pages fill the screen, so they are easy to read. 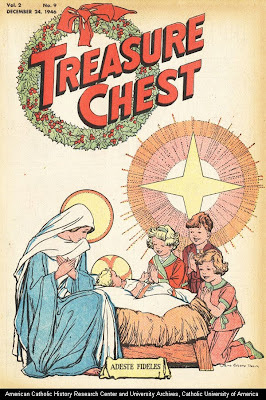 there was a comic book called Treasure Chest. It was a Catholic comic book. Lo and behold, doesn't my online search for Treasure Chest comics meet with success. The first issue was published 6 weeks before my birth. It was still going strong in 1954, when I first heard of this comic. I never was a big comic book fan, though I did develop an affinity for MAD magazine during the 60's. Somewhere in my workshop is a box that still has a bunch of those old issues. They would be in one of those 8 or 9 boxes that have never been unpacked. It has only been 18 years though so I still have time. I was real big into comics in the 1965-1968 time frame. darn right fanatical and very loyal to DC, those wonderful people who chronicled the events of the Justice League of America and a few others who were not part of the "Secret Society." Unfortunately, I think most of them disappeared when my parents moved from Hazel Crest to Lisle back around 1986. However, since they still have a number of boxes they haven't unpacked yet, maybe they are in one of those. I have a number of first editions including the first couple years (complete) of Plastic Man and the Inferior Five. If they still exist they should bring a few dollars per issue. ...I have a number of first editions including the first couple years (complete) of Plastic Man and the Inferior Five. If they still exist they should bring a few dollars per issue. I can see that I was born too early, if I missed Plastic Man. I'm all in favor of the Blue Beetle, which I found on that web site. The quality of the illustrations leave much to be desired, but I like the spirit of the thing. Here's something about Plastic Man. Too bad I can't find the gold medal that I won at a swim meet, in 1960. That's when gold was, I think, 35 dollars/ounce. Lou was a big fan of Mad Magazine, too. Could never understand an interest in Mad Magazine or Monty Python. Don't tell me. You're also a fan of Monty Python? Yes, I'm also a Monty Python fan. And also a Three Stooges fan. All three of those, I think, tend to be mostly male things for some reason. I saw Monty Python's Holy Grail movie several times and still chuckle just thinking about certain scenes in it. I also love their Spanish Inquisition scene which I've watched several times on Youtube. Most interesting that you lump Monty Python, the Three Stooges and Mad Magazine in the same boat since they represent 3 distinct brands of humor. Mad magazine is straight parody, albeit sometimes with a unkind overtone to it. The Three Stooges is slapstick, and a malicious brand of it at that. I have never really included any of the three in my favorite list either. Mad and Stooges were both intent of having fun a someone else's expense and the stooges were worse because they wee just downright mean to each other. I did like the Spy vs. Spy strip though and I eventually was able to appreciate Monty Python to some extent as I started to begin to understand British humor. When in high school, our science club went to a Physics lecture where the only thing I really understood was the opening joke. The lecturer was some professor from a university in England and his opening went something like this. He said he often had a problem with telling a joke at the beginning of his lectures in America because most Americans didn't fully appreciate British humor. Once he finished th joke, he said only about 50-60% of the crowd would laugh. However, a few minutes later, the other 90% would laugh as they understood the joke. Monty Python Rocks....i soooooo love that kind of humor! I have to admit to the first time seeing it, i was completely at awe over why the heck everyone was laughing! I had never before seen or heard anything of dry humor before...and adopted it as a wonderful way of life in general to cope with life. There is nothing funnier than seeing killer bunnies, horses thatare sounded from coconuts clopping together, and "come back and fight like a man" causing you to spit your amaretto out accidentally every single time! And secretly for years my sister and i sang a song to piss my parents off (if they grounded us or something) and ommitted one single word..."sperm"
We sang loud and clear....every ..... is sacred, every ..... is grand. If a ..... gets wasted, God gets quite irate....ROFL!!! lol...and the shrubery...ok, i'm done@! I lump them together only because the three tend to appeal more to males for whatever reason, not because of any other similarities between them. I guess I could also lump Benny Hill into that group, which I also enjoyed and, while British, is yet another entirely different type of humor. Disclaimer: no Stooges were harmed in producing this post. You mention what are also my favorite scenes from the Holy Grail. The Black Knight scene in particular never fails to make me laugh. Point taken and yes, it would be fair to include Benny Hill. Given the right circumstances, the feminine gender does find him funny. Benny Hill was one of the hottest shows on when we got married and Cheryl just absolutely despised his brand of humor. As a result, I didn't watch him very often. One night I happened to have him on when she entered the room. After a few scowls and nasty remarks she went about her business. Benny was doing his aging-woman skit and proposed a toast -- May I live as long as I want to, and may I want to as long as I live. That was the turning point. Cheryl laughed at it and repeated over and over. After that she decided it was a pretty good show after all and we watched it together when we had time. Also, the Vorpal Bunny scene from the Holy Grail is one of my all time favorites as well. and then spent an hour, online, reading commentary on same. who recount the football/baseball plays, and offer commentary, during the World Series or the Superbowl. exact thing done by the opposition. The practioners of this art are seasoned fighters. Shakespeare was a fine observer of human characteristics. Yet it isn't to Wm. Shakespeare that I turn, for the clearest view of human nature. Man's capacity for self-deception is nearly unbounded. Happily, God knows this, and sometimes He saves us from our own folly. I will praise the Lord and sing to my God, as long as I have life..."
To me, politics is interesting only to the extent that I am able to delude myself into thinking that candidates of either party actually believe any of the things they espouse during a campaign. I am more than aware that once elected it will all be about getting reelected in the next go-round rather than doing anything to promote the common good. Politics has clearly become the art of finding the "right message" that will entice the greatest number of people to think that their values are being supported while knowing that none of those values will be taken into account in any future action. To me it has become the ultimate symbol of disrespect: asking the multitudes for their opinion knowing you are going to dismiss it and do what you want anyway. I've spent too much of my life with such people to actually give much hope that anything is going to change. It is very rare that we get upset enough to actually hold people accountable for those lies; instead we just reelect them as their punishment. You're right, Reen, that we need to not trust in princes. unalloyed boon to the nation, the bankers are all Mary Poppins, party X is all good, party Y is all bad. None of us came down with the last rain shower. I was much struck by what an author wrote many years ago. of what the country wants and requires. I add my own variation, to the theme of this era - i.e., politics as religion. With new scriptures, and saints and martyrs and secular holy days. I hold that the 2nd half of the 20th c. was a time of massive intellectual sloth. Bumper sticker mentalities. Jargon. Slogans. Each displacing critical thought. What Dietrich Bonhoffer called 'cheap grace.' He had to speak quickly, for the Nazis executed him. Shall now step down from this apple crate I'm standing upon, figuritively. or alliances or whatever. Slogans will fail, in the presence of Godhead. "Tell Me, dear heart, not what you said, but what you did." Our biggest single problem is that most of the people seeking office are politicians. What we really need to elect are statesmen. Those are few and far between and generally are smart enough not to want to hold office. As you said, James, statesmen are few and far between. contributions to our nation state. which did not, in the early days, bring approbation and praise. It was a courageous and principled stance on his part. demonstrated, in that crucial struggle. bringing freedom to Eastern Europe and the fall of that monstrosity, the Berlin Wall. I am old enough to recall, vividly, the time when that wall was built. my stomach, as that damn thing was built, in the summer of 1961. I was then 15. Neville Chamberlain was considered a statesman, in his time. or proactive interfacing, could have stopped Herr Hitler. We, too, are living out history, which to us is current events. How will those in the future assess our actions or lack thereof? Who will then be considered the statesmen of our time? I fear that historians will pay Obama an undue amount of attention and admiration. Will he be known as the great leader who proved socialism can work? Or will he be known as the spend-it-before-you-make-it president who led America into near-bankruptcy or worse? As much as I would like for the programs he espouses to be successful, I don't see how they can do anything but make things worse in the long run. Here a thought for the day that should make you think.... or something. I laughed myself silly. I was attempting to connect to the home page for the U.S. Naval Base in Corpus Christie Texas. 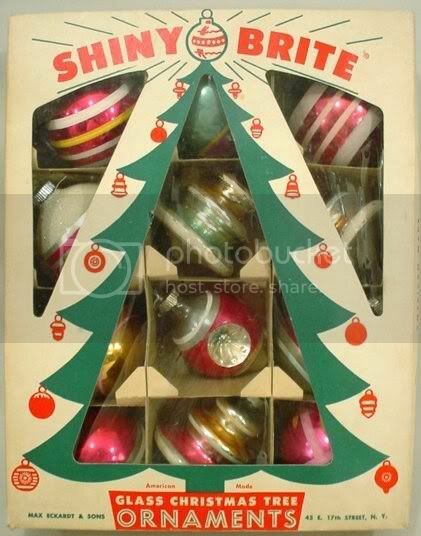 Spent some time on ebay, this evening, viewing the vintage Christmas collectibles. Think about how I feel when I see "Vintage" Sliingerland and Ludwig drums that were built in the 60s and 70s -- most of which were built AFTER my own drum. back in 1971 when our parish had its first annual antique show and sale I learned that in oder to be a true antique, it had to be 100 years old (except automobiles, they only need to be 10). Anything of interest less than that is called a "collectible." Hmmmm.... my van in a 1996 model. I been driving an antique car for three years. However, in the state of Illinois defines an antique vehicle as being more than 25 years old (or 20 for firetrucks) in order to get antique plates. They are also only allowed to drive to and from shows, exhibitions, demonstrations, and I think repair shops if I read it right. That's my understanding, too, James. However, in the state of Illinois defines an antique vehicle as being more than 25 years old (or 20 for firetrucks) in order to get antique plates. By the 25 year standard, a '62 Chevy Impala would be considered an antique! Have you ever noticed the colors of 'vintage' Christmas printed material? The cardboard boxes have a dull finish, with a lack of a range of colors. The moment I gaze on one of these boxes, a sense of nostalgia is felt. Notice even further, it is he product itself that is colorful and draws attention, not the packaging. That's back in the days when folks (including marketers) paid more attention to the product than the marketing. Yup. Different times those were. IMO, also better in many ways. Thinking aloud. No reply expected. An indirect democracy, in the form of a republic, was a noble experiment. It shall not last, I think. I think it likely that God may be withdrawing His hand from our nation. he/she exits the birth canal, then I think that this nation's noble experiment, in a democratic republic, is nearly over. Historically, tradgedy after written tradgedy points to a 'fatal flaw' in a protagonist. In like manner, brutality toward unborn life will spread to other forms of same, I think. It is our nation's Achilles heel. get their wish for gov't control over medical care. Who will then define "the common good?" 'life, unworthy of life,' as was the case under National Socialism, aka the Nazis? have forced open a truly tragic Pandora's box. 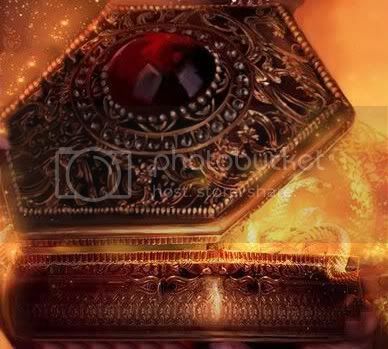 I think that the choice before us is the Ark of the Covenant or Pandora's box. God help us as a nation if we choose the latter.